Almost everybody uses cloud hosting yet few people know what it is. Cloud hosting or cloud computing can loosely be defined as saving and accessing all your data online. With so many cloud services out there to choose from, wouldn’t it be nice to have all of their best features in one place? There’s how the new kid on the block has played their game right. Cloudiro’s user dashboard is really simple and intuitive. You can easily manage your resources, monitor the health of the cloud, calculate your bills, and automatically control failover procedures. 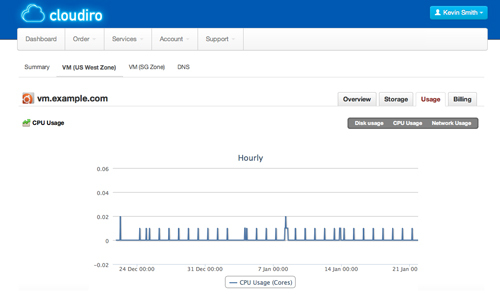 Here is a sneak peak on how Cloudiro gives you vital stats on your virtual server’s CPU usage. Low RAM – Low RAM will imply less speed. If you have tried to play a high level game on a computer having low RAM, you know what I mean. Low disk space – If you are running out of disk space then it will cause two problems. One it will slow down the speed. Two, where will you store your new data? Low processing power – It will result in interruptions and loading problems. If you are facing any one or more of these problems, then it’s time to upgrade. You can upgrade all three of them with Cloudiro, whenever you want to and to whichever plan you feel is appropriate for you. Cloudiro understands that not all companies are equal. Big ones with a lot of data will require huge storage spaces and other features while the smaller ones will require fewer features. You are free to choose your plan out of the 13 available plans with a pay-as-you-go feature. Regardless which plan you choose, you will be up and running in no more than 10 minutes. Obviously you will need an OS to run your online hosting. Cloudiro provides you with fully pre-configured and customizable operating system environments. Cloudiro hosts a template library for different versions of Linux, Unix and Windows, both 32- and 64-bit versions. This makes a breeze for developers to deploy any type of applications. Cloudiro consists of a team of developers who possess relevant domain knowledge and massive experience in cloud computing over 10 years. They constantly seek to innovate, only to provide the best for their users. What’s to worry when you are well taken care by people who love and breathe technology? Rest assured that you are in safe hands. Bonus:Currently,there is a great promotion.You can use coupon code CLOUD15BEEP (15%) which works for all VM product EXCEPT the Starter Node.